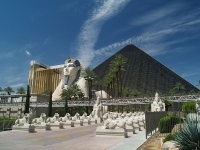 The Luxor Hotel, themed on ancient Egypt, is one of the most prominent sights on the Las Vegas Strip. It is a massive black-glass pyramid containing 36 floors of hotel rooms. Shining through it into the night sky is one of the world's most powerful light beams, which they claim can be seen by planes circling Los Angeles. The ground floor of the hotel is given over to a massive casino, which stands beneath a recreation of King Tut's Tomb. Other than gambling, entertainment at the hotel includes an IMAX theatre, gyms, swimming pools, and exhilarating shows by comedians, dancers and singers. The Luxor is a Vegas landmark and one of the most popular casinos and hotels in the city.